Click for Part 1 and Part 2 of this ongoing blog about itchy dogs. Though many itchy dogs suffer from food or environmental allergies (as discussed in previous blogs of this series), parasites of the skin and hair coat (called ectoparasites) are another important cause of itchiness in our canine companions. In fact, performing parasite testing should be considered a veterinary standard for itchy dogs. Ruling out parasitic causes of itchiness is important because they can greatly complicate diagnosis and treatment of other skin related diseases. Though there are many individual species, in this and the next blog in this series we will examine four general groups of ectoparasites that infest our dogs. The first experience I can recall involving lice was in elementary school; a time period in life when an infestation of head lice could turn any otherwise sanitary, well-meaning child into the classroom leper. Luckily for us dog owners, we don’t need to fret much about our own health if our canine children come down with an infestation of lice as they tend to be very species-specific in regards to which creatures they choose to call home. Lice come in two main varieties; chewing lice and sucking lice. Sucking lice have sharp, piercing mouthparts that can be used to feed upon the host’s blood. This ability to break the skin increases their likelihood to cause significant skin disease and anemia; two clinical signs that don’t tend to be associated with lice of the chewing variety. Dogs affected with sucking lice will often be itchy, have obvious bite marks on the skin (sometimes prone to infection), skin wounds from scratching, and often have an unkempt or sparse hair coat. Chewing lice tend to feed on dead skin and other skin debris. 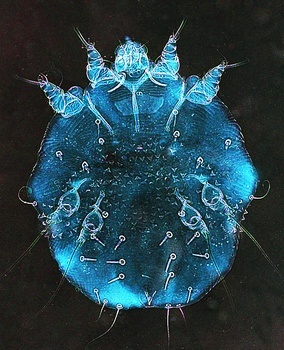 Though chewing lice can cause significant itchiness, they tend to cause much less skin disease than their blood sucking cousins. Lice are transmitted from host to host via physical contact or through sharing dog brushes/toys between infested dogs. Lice are often diagnosed via visual inspection or through use of clear tape that can be used to trap lice and their eggs from the hair coat and then visualized under a microscope. Mites are a diverse group of parasites that, in many cases, can cause severe itchiness and skin disease in dogs known as mange. Mites vary in their overall pathogenicity and their ability to infest multiple species of animals. In addition, they are often one of the more challenging parasites to diagnose and treat. Fur mites of the genus Cheyletiella (also known as walking dandruff) are highly contagious, common parasites of dogs. These mites are known to feed on the outer layer of skin and associated fluids on the skin surface. Classic signs of affected dogs include scaling of the skin, itchiness, and hair loss. It is often possible to identify the small yellow mites upon close inspection or by using the same clear tape technique used to diagnose lice. Since these mites only live on the hair and skin surface, the clinical signs associated with infestation are relatively mild. While Cheyletiella infestations tend to cause relatively mild clinical signs, mites of the species Sarcoptes scabei often cause severe itchiness and skin disease in dogs referred to as canine scabies. This species of mite burrows into the skin where it lays its eggs and causes a severe inflammatory reaction. In early stages of infestation, mites typically infest lightly haired areas. However, in severe infestations, dogs may have skin lesions covering the entire body including red papules, crusting of the skin, and hair loss. Dogs infested with Sarcoptes have intense itchiness often leading to self-harm simply through the process of scratching. Dogs are so itchy that they will often stop playing or eating in order to take long breaks to scratch themselves. The margins of the ears are a common location of infestation. Rubbing of an affected dog’s ears often elicits a “scratch reflex”. One other mite type that commonly causes skin issues and itchiness in dogs is the genus Demodex. These mites are considered normal fauna of canine hair follicles and are passed from mother to puppy shortly after birth. For unknown reasons, some dogs have an inadequate immune response necessary to control the proliferation of these parasites. In these cases, dogs can develop hairloss, skin inflammation, and itchiness. In young dogs with only a few isolated lesions, about 90% of the time the lesions will resolve on their own without treatment. In some cases, the lesions multiply or form large affected areas of the body leading to significant clinical signs that must be treated. Older dogs that develop lesions due to Demodex for the first time are often immunocompromised and should be evaluated for other disease processes. The mites discussed above are the most common, but by no means an exhaustive list. The veterinary gold standard for diagnosing mites is a procedure known as a skin scraping. Unfortunately, in many cases it can be difficult to identify mites with this technique and multiple scrapings may need to be performed in order to obtain a diagnosis. The majority of mite species known to infest dogs are species specific, but can transiently infest (and cause significant clinical signs) in other species, including humans. In addition to treating the dog, it is important to consider environmental control of mites through cleaning of all dog bedding and grooming equipment. In some cases, people also may need medical treatment to deal with the symptoms of the transient mite infestations obtained from their dogs. Treatment of lice and mite infestations are most commonly performed using topical therapies. Some monthly topical parasite medications also prevent and/or treat lice and mites. Talk with your veterinarian about medications and the parasite risk factors in your region in order to develop an adequate parasite prevention plan for your dog. In the final part of this ongoing series of blogs about itchy dogs, we will take a look at some of the most common parasites that give our dogs the itch; fleas and ticks. This column is not intended as a replacement for personalized veterinary care. Please consult your veterinarian for medical advice regarding your pets. European Scientific Counsel Companion Animal Parasites (June 2012). Control of Ectoparasites in Dogs and Cats- ESCCAP Guideline 03 Second Edition. Malvern, Worcestershire: ESCCAP. Do You and Your Dog Have Similar Personalities?